MITYANA – The Uganda Police bus that had earlier been announced missing with the driver has been found. This website has learnt that Geoffrey Mwase, the driver is also arrested after the bus was intercepted at the Morgana Petrol Station in Mityana District on Monday night. Also according to URN, the bus whose number plates had been removed was intercepted by police officers who were on patrol duties. The bus was intercepted at around 11pm last night and brought to Kampala while the driver is still in detention at the Mityana police station, URN reports. The police spokesperson Emilia Kayima and his deputy Patrick Onyango could not be reached for a comment. Asked on comment on matter, Police commissar AIGP Asan Kasigye confirmed the development. “It’s safe with us,” he said without giving more details. Police on Monday had launched a manhunt for its bus that according to a memo in circulation went missing on Sunday night. 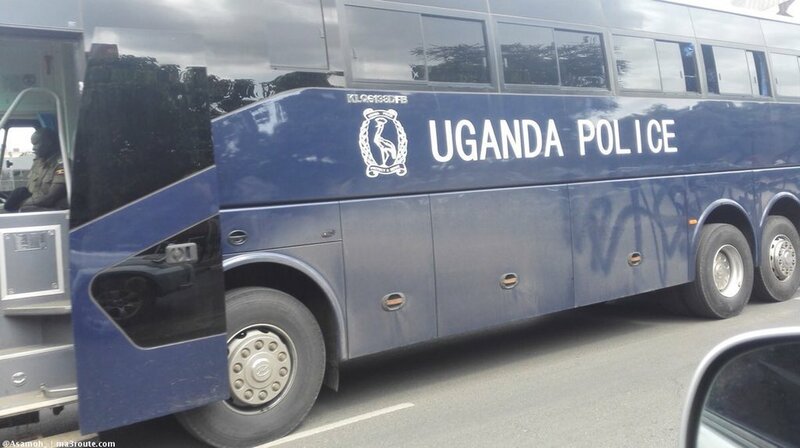 Police director of engineering and logistics, Godfrey Bangirana, had indicated the bus went missing on Sunday at 1:00am along the northern bypass with a driver whose contacts had gone off. “Be informed that Police Bus Reg No: UP 5484, Higar make, Police Blue (color) has gone missing. It was last seen on night of Sunday 23/12/2018 at around 0100 hours along the Northern Bypass, Kampala,” the memo reads in part.